That's what I feel like. You know the one where all the seeds are planted and all you can do is wait. Who knows what critters will eat your food or if today's snow will wipe out all the fruit blossoms? It could be a good harvest or we could starve. The four of coins or pentacles? Time will tell. 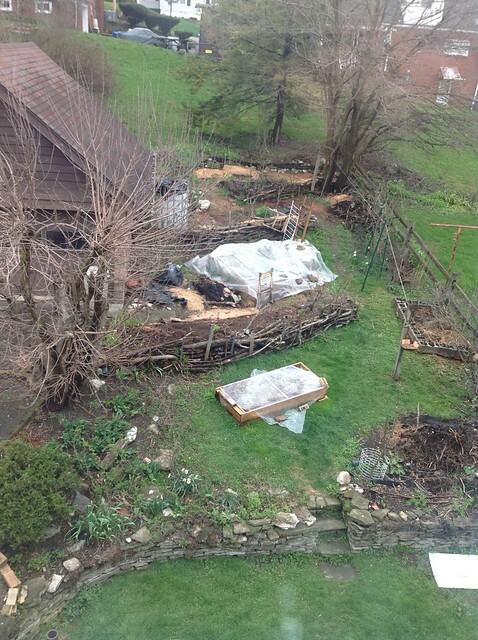 An overview of the back yard as it stands right now from the attic window. Let's take a tour. And starting in the back, behind the garage, it looks like this (below). It's mostly shade except late in the afternoon. The roses do okay. We smelled a skunk there last night and wonder if it lives in the neighbor's lilacs. This is technically an alley that belongs to the city. It was never developed. They call it a "paper alley". 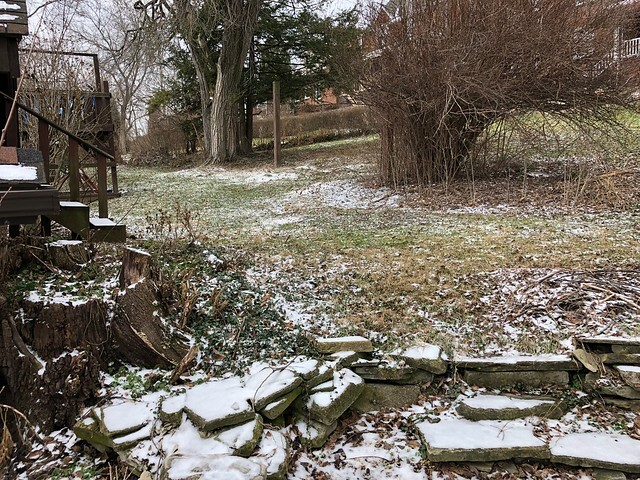 Our farthest spot is the Kuiper belt, under a multiple trunked mulberry is a section of garden that hasn't changed much. The mulberry is thirsty and has shallow roots, making it murder to dig anything. 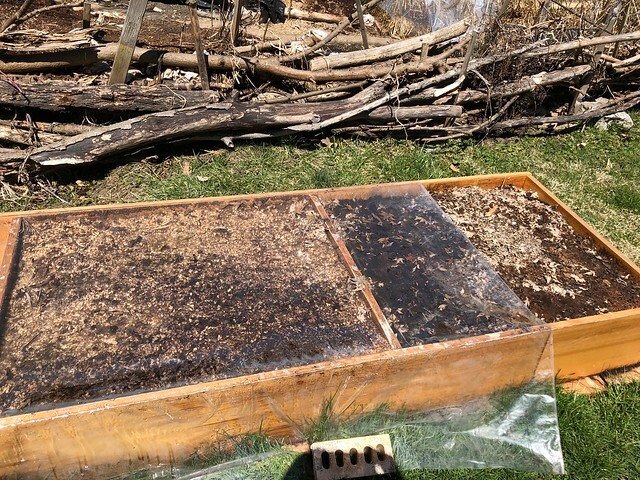 The roots even infiltrated a raised bed garden. They are yellow and spread out quite far. I need to cut this bad boy way back to tame some of the roots. It will let in more light and hopefully some of the roots will die back, adding more fertility to the soil as they decompose. I have no power tools so it may take all summer to cut this tree. The black raspberries, honeybushes and gooseberry are doing well. So is the pear. The cherry, not so much. I want to take it out and put in another goumi berry when money allows. Taken in October of 2016. Four strawberry plants did survive up there. Deer regularly come through, trampling things. Currently we are hoping for morels to come back. Last year, they were found on April 20th. The next level down the hill we are calling Ceres. It has the water container against the garage. That is a project for later this summer. I need to hook that into my drainpipe. It needs to be taken apart, wrapped in black plastic to avoid growing algae, and then fittings need to be researched. Not sure what kind it has now. It will be helpful in watering the upper section. There is an Asian Pear toward the center of that row. 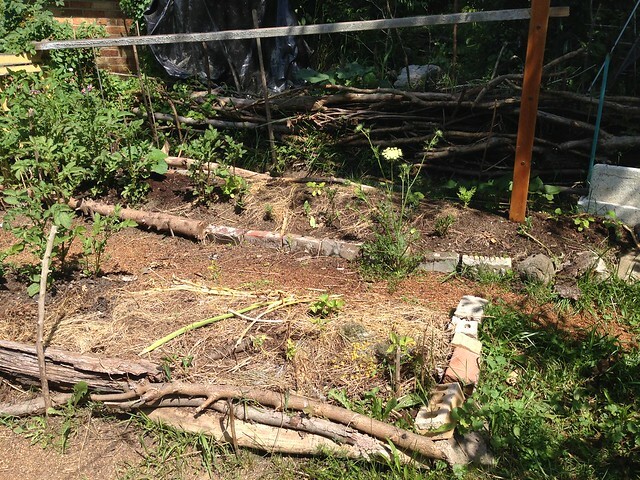 An old brick raised bed structure still needs to be removed. Tomatoes will probably go in there this year. Last year it had squash. And in the far corner is a pile of Siberian elm branches. They are growing lichen that I dye with. A blackberry is along the fence line that needs a trellis or some sort of support. 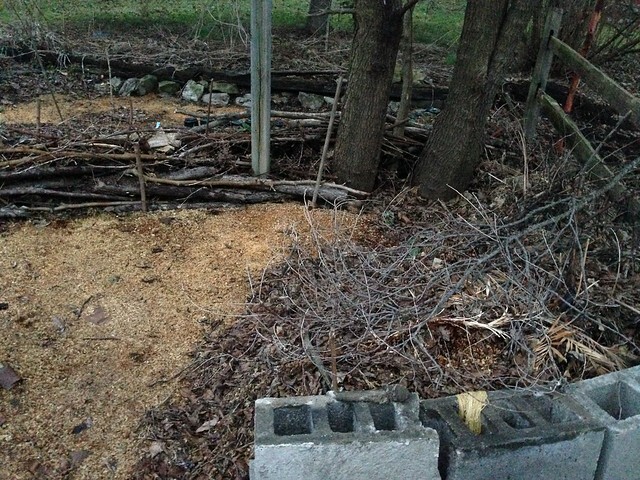 At the moment, the brush pile is a compost pile and possibly a home for a garter snake. Going one more section down the hill below Ceres, is the sunniest location in the whole yard. When we first moved here, I wanted to setup a garden in this location, but the local ground hog had other ideas. So it never happened until more recently. The ground hog was a solitary male and eventually died of old age. Last year I grew tomatoes in the section with fabulous results. Sweet potatoes too. Potatoes did okay but not spectacular because of hard pan clay. Over winter, my strawbales went here. Still harvesting salads out of there. But they'll be bolting before you know it. So succession planting will happen. This year I'm planting corn. 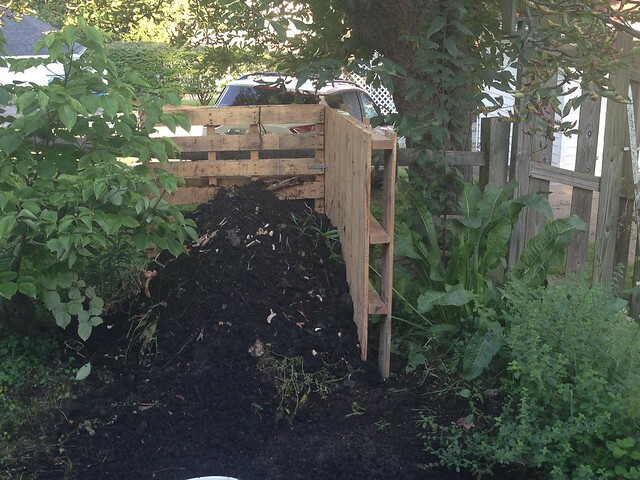 I need more compost to make that work as well as a fence. Probably put in a three sisters with squash and beans. The straw from the bales will make a nice mulch. Eventually, I will build raised beds in this location and make a high tunnel greenhouse. The walls will come down in summer so Ceres will still get plenty of light. There is no terrace on this section. It does have a slope but not too steep. Here is a picture from 2016 where I dug a pit for sweet potatoes. This yard is all sorts of hill. Each part with a different grade. The next section down follows the steepest part of the driveway. We call it middle earth. It is deeply terraced. I added more posts last week for support. 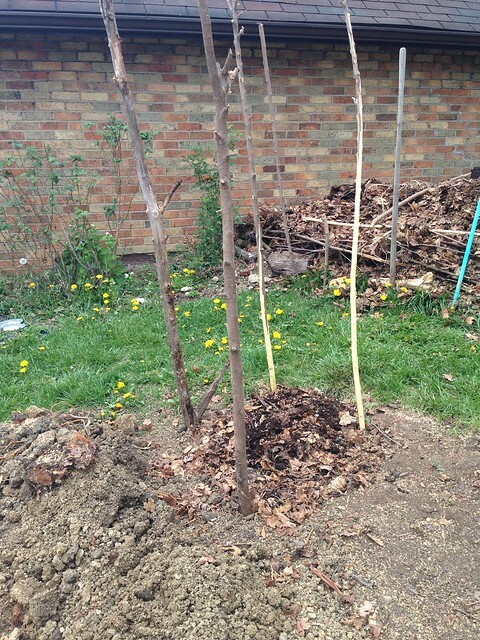 It started as a hugel bed with tree branches and stumps rotting under the soil. The soil has subsidence issues the first few years until the air pockets are all filled in. I used coffee grounds. More tree branches have been added since the picture was taken. Middle Earth is home to red raspberries as well as a dye plant called Beiden. We call it Joe. 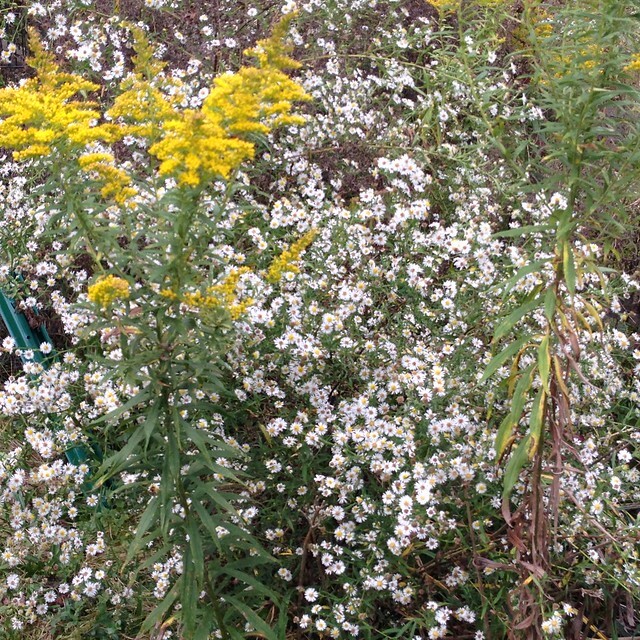 It's a type of coreopsis but doesn't yield as bright of color. There are also two skirret in this section. They do not like the excessive water from the garage drainpipe. The area needs a raspberry fence. Eventually, the whole thing will be raspberries. 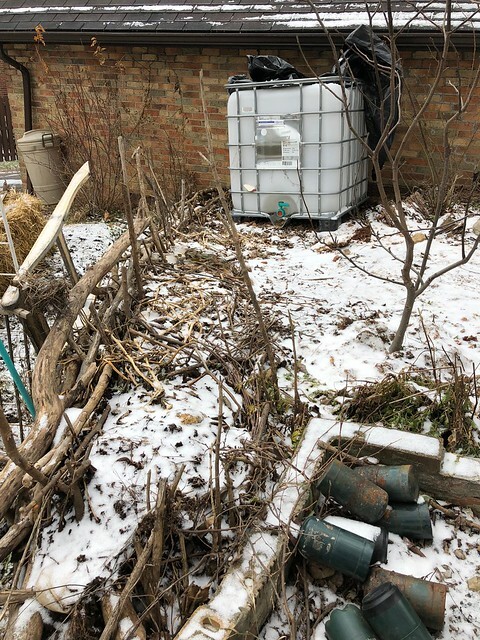 This year, I plan to grow more tomatoes in here. Last year there were potatoes and beans. 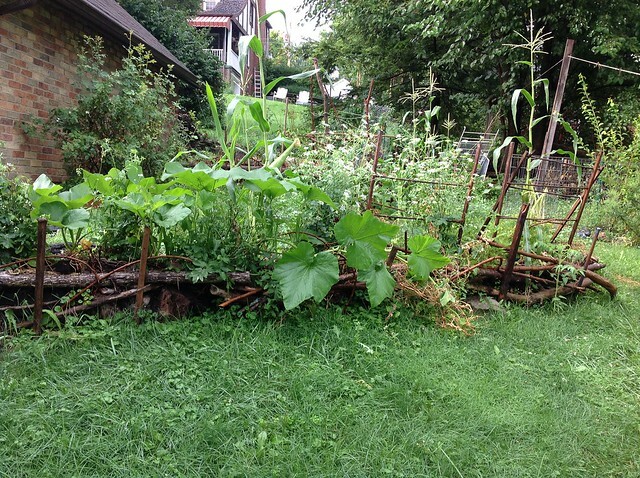 Serious trellising needs to occur but there is no budget for it. There is a tree along the driveway (not shown in picture). It's mulberry as well. It's getting severe trimming done right now. I think I have three more big limbs to cut. It takess 500 saw cuts to get through a big branch, minimum. It yields most of our harvestable fruit because we keep it short. Along the east side of the garden is a plum tree that Chronographia is turning into an esplanade. Behind it we throw thorn trimmings from the barberry and roses to deter deer. The garter snake suns itself there in summer. Below that is a weed patch. 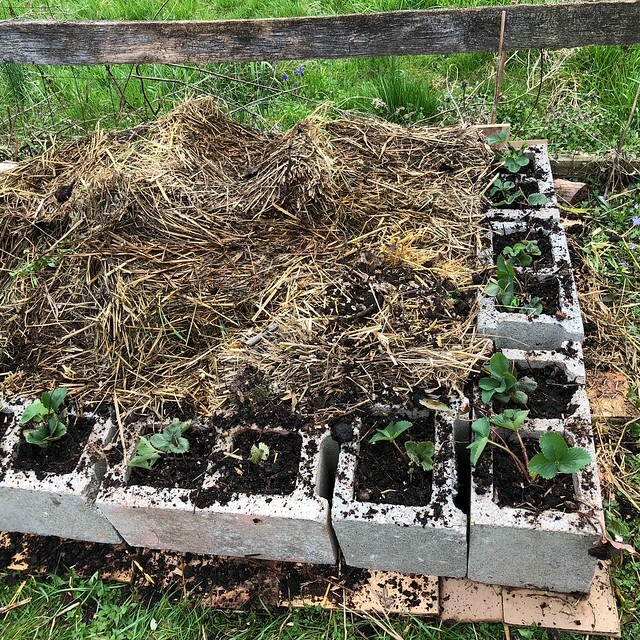 I just turned the weed patch into a cinder block garden for strawberries, potatoes, peas, and melons. Below Middle Earth is the bookcase garden. I planted fingerling potatoes in here. 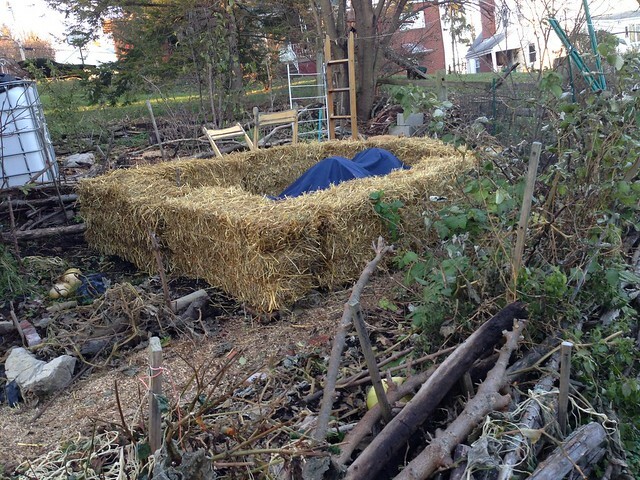 The bed is pure compost, coffee grounds, sawdust, and fall leaves. Hoping to get a good yield this year. 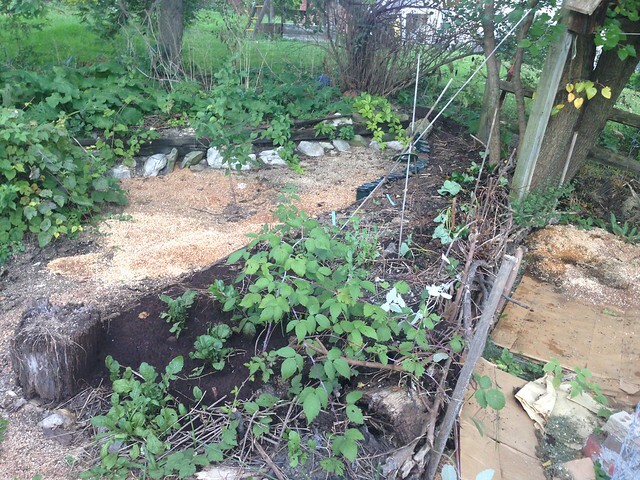 Another bed will get built next to the compost pile. I can fit a 4' x 6' in that location. It'll be just to the right of the stone steps. The remaining parsnips in that area will be allowed to go to seed. To the left of the steps is a Russian tarragon and black raspberries. On occassion we've grown tomatoes or squash in between. All of those were volunteers. 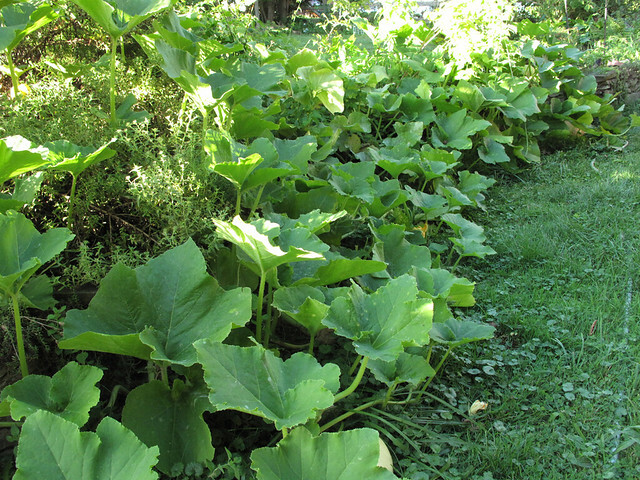 Below the stone wall, it is too shady to grow much. We use that area for outdoor cooking, portable tables, and projects that need to be done outside. There is just enough room to set up a pop-up tent for photo shoots to get into shows. This concludes our tour of the backyard growing area. Wish me luck in filling it with as much food as possible. The trellises needed will be of metal electrical conduit and 1/2" to 1" hardware cloth, with an 18" rebar stake that they'll slide over. Fingers crossed. I need sales to make it happen.